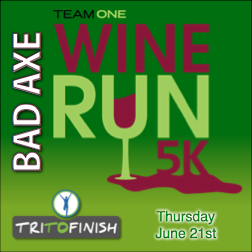 Details: Team One Wine Run Bad Axe 2018 Overview Team One Credit Union and TriToFinish are teaming up to bring you the Team One Wine Run/Walk to Bad Axe to help promote the great things that the area has to offer! This 5k walk/run will begin and end at the Bad Axe City Park in the heart of historic Bad Axe. A glass of wine awaits all (age 21 and older) participants after they complete their run/walk. Instead of heading right home after work why not relieve your work-day stress with a relaxing evening of wine, snacks, friends&oh, and a little exercise! Take advantage of this awesome event to get outside and have some fun. Proceeds from this event will benefit Relay for Life of Huron County. Course Description: The Team One Wine Run is a USATF-sanctioned 5k course that begins and ends at Bad Axe City Park. The route leads participants south on hanselman to Soper, east on Soper to Silver, south on Silver to Elm, east on Elm to Nugent, south on Nugent to Cedar, west on cedar to Silver, north on Silver to Soper, west on Soper to Hanselman, north on Hanselman to Palace. The route is flat, providing a great backdrop for both the competitive and leisurely runners and walkers! Packet Pickup and Late Registration: Wednesday, June 20th from 4:00-6:00 at Team One Credit Union of Bad Axe Thursday, June 21st from 4:45-5:30 PM at Bad Axe City Park Awards Top 3 Overall Fastest 5k Male and Female (chip timed actual) All participants 21 years of age and older will receive an etched wine glass and 2 wine tastings in the event tent upon completion of their event! (Please note: ID required to receive wine glass and wine tasting tickets) Appetizers will also be available after the race in the event tent at Bad Axe City Park.